* Free Natl Reports avai. To Download archived copies of our Safety Bulletin - Click here! See how KEYS can help!! NEW BEDFORD, Massachusetts 11/26/01 -- Three teen-age boys are scheduled to be arraigned today in a Massachusetts courtroom after plotting to kill students and faculty at New Bedford High School where they are enrolled. Eric McKeehan, a 17 year old student at the New Bedford High School, stands in the 3rd District Court in New Bedford, Massachusetts, November 26, 2001. He was charged as one of three students who were allegedly plotting a bombing and shooting spree at the school. Police found written plans, bomb making components, and weapons when they arrested the three suspects. Eric McKeehan , 17, a junior at the school is being held on $10,000 cash bail and two unidentified 15-year-old freshmen are being held on $5,000 cash bail each. They allegedly modeled themselves after the two students who carried out the Columbine High School massacre in Littleton, Colorado. [Assessment Certification Training of At-Risk Students] The three students are charged with conspiracy to commit murder, conspiracy to commit assault and battery with a dangerous weapon, and possession of ammunition. Under Massachusetts law, juveniles are defined as being between the ages of 8 and 16. 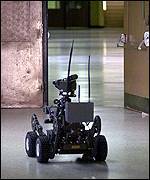 Police used a robot and sniffer dogs to search the school. The search of the 3,300-student New Bedford High School was carried out after a janitor discovered a letter detailing a Columbine-like massacre, according to police. The letter "explicitly outlined an event that would occur on a Monday," according to authorities. It said the attack would involve "explosives or the use of explosives, weapons and injuring or killing students and faculty," police said. The letter outlined the suspects' plans to detonate explosives, shoot fleeing students, and kill themselves when police arrived. "They said specifically it would be bigger than Columbine," police Chief Arthur Kelly said. Authorities also found photos of people posing with weapons. Police held out the possibility of more arrests. Police said they decided to make the arrests after the letter was found. The letter said the attack would happen on a Monday, police said, though it didn't specify a date. "We decided not to let another Monday go by," Kelly said. Eric Harris and Dylan Klebold shot and killed 12 students and a teacher before killing themselves in the April 1999 attack on Columbine High School in Littleton, Colo. It was the nation's bloodiest school shooting. A fellow student alerted police in mid-October that there was a plot to attack the school. [Kids are the Keys Assembly] Police questioned one of the suspects after they discovered bomb-making materials at an undisclosed property the following week. Police Chief Arthur Kelly said the bomb lacked key elements that would arm it, so police could not make an arrest. No one answered the door at McKeehan's home on Saturday. McKeehan moved into a three-story house this summer and lived with a friend, neighbors said. There was no telephone listing for his name in New Bedford. Jenna Reed, 15, who used to hang out with McKeehan, said he had joked about "how cool it would be to pretend to blow up the school." Reed said none of McKeehan's friends felt threatened. "He talked about it but he was joking around," Reed said. "I'd never expect him to do anything like that." School board member Kevin Finnerty said McKeehan is a junior and the other two are freshmen, but he did not know them personally. "It's always been a very safe school," he said. "We've never had any really serious incidents there." Keys To Safer Schools.com would like to praise the student who came forward with a true sense of community and broke through the wall of silence. This simple act of reporting may have saved the lives of hundreds of students and staff. Keys also praised the police and school administration for taking the report and the letter seriously and acting quickly to insure everyone’s safety. See the Lock Out Violence Everyday Campaign - A community violence prevention program. To Learn How "Keys To Safer Schools" Can Help. Learning what to look for - "Early Warning Signs"
If you have any comments or questions please Email us at keys@keystosaferschools.com.